Fife Coastal Path – a well signposted walking trail that currently links every coastal settlement between North Queensferry and Crail. Great Glen Way – 117 km/73 mile from Fort William to Inverness, following the route of the Caledonian Canal and alongside Lochs Linnhe, Lochy, Oich and Ness. Kintyre Way – 141 km/87 mile walk from Tarbert, at the northern end of the Kintyre peninsula, to Dunaverty Bay, near Southend at the southern end of the peninsula. The Skye Trail – 128 km of tough terrain including spectacular mountain and coastal scenery. Southern Upland Way – 340 km/212 mile walk from Portpatrick, on the west coast of Dumfries and Galloway, to Cockburnspath, on the east coast of the Scottish Borders. Speyside Way – 135 km/84 mile walk from Buckie to Aviemore, roughly following the River Spey. West Highland Way – 152 km/95 mile walk from Milngavie, just outside Glasgow, to Fort William in the Highlands. Most of these walks are well sign-posted along the route and it is possible to do parts of them on their own, although it is advisable to check the availability of public transport first. However, not all the routes are official and some may include sections that are only suitable for experienced hillwalkers. 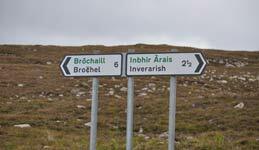 Before setting out on any of the above routes, check the web sites above for further information. Walk Highlands – The number one walking website in Scotland.